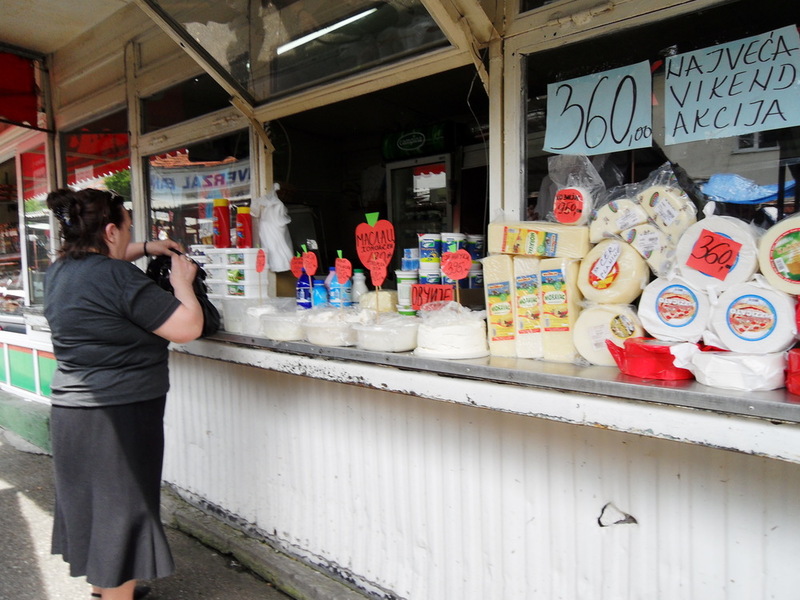 One of my earliest memories as a child was visiting a farmer's market where my family lives in Serbia. I remember being asked what I would like for supper. I insisted on having a cucumber salad at the beginning of May and I couldn't possibly understand that 'it wasn't in season'. Clearly, I was used to the luxury of imported foods. This experience was my first taste of what eating seasonally meant. "It starts with a transaction that's essential, an exchange of food, but it widens to include the fundamental experience of being alive. And by providing the element of surprise, going to the market frees us from our rigid agendas and teaches us what being alive can mean." Hirsheimer is an American author of Canal House Cooking Volumes, a well-known series of amazing, simple and meticulously written recipes. Hirsheimer and Knickerbocker spread their art of cooking authentic cuisine with character and passion. What I love about the Farmer's Market Cookbook is that they alphabetize produce respective to the season they're available in. Of course, seasonality differs from country to country. Check out your local, seasonal produce guide or chat with a farmer at your local market. Buying food by the season is a great place to start for anyone interested in eating to improve their health. Starting with a recipe that focuses on one fruit or vegetable that is in season can make any novice cook that much more capable of making delicious food. Fresh, locally produced and organic food inherently tastes better than commercially store bought. Once something is picked, it begins degrading in nutrients and flavour. Farmer's market vendors usually pick their produce the morning it's sold whereas supermarket foods are usually picked before they are ripe and are altered chemically to ripen when they arrive at the store. Here are some of my favourite spring vegetables in recipe form using some of Hirsheimer's Farmer's Market Cookbook recipes. I used sea kale in this recipe. It is a Spring vegetable that looks like celery and tastes slightly of asparagus. Bring a medium pot of water to a boil over high heat. 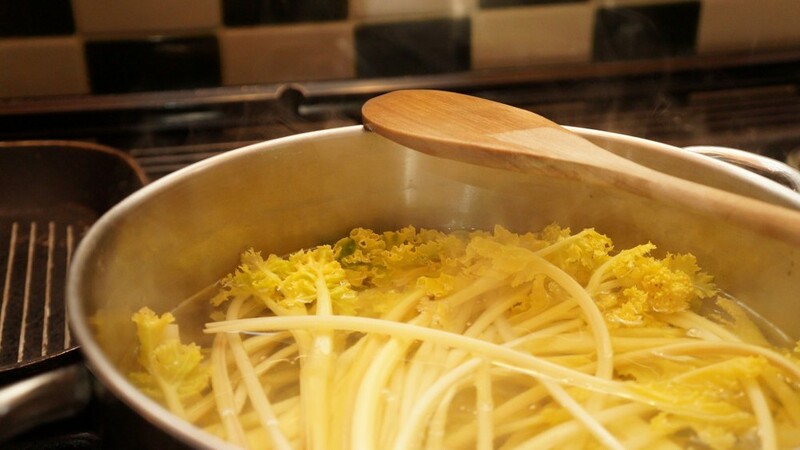 Add asparagus or sea kale to pot and cook until tender-crisp and bright green, 1½–2 minutes. Do not overcook. Drain, then immediately plunge into a large bowl of ice water; set aside to cool, 2–3 minutes. Drain again, then transfer to paper towels, pat dry, and set aside. Whisk together soy sauce, sesame oil, and chile oil in a medium bowl. Add asparagus and toss. Transfer to a serving bowl and garnish with sesame seeds. In a large skillet, cook the bacon over medium-high heat until crisp, about 3 minutes. Using a slotted spoon, remove the bacon to a paper towel to drain. 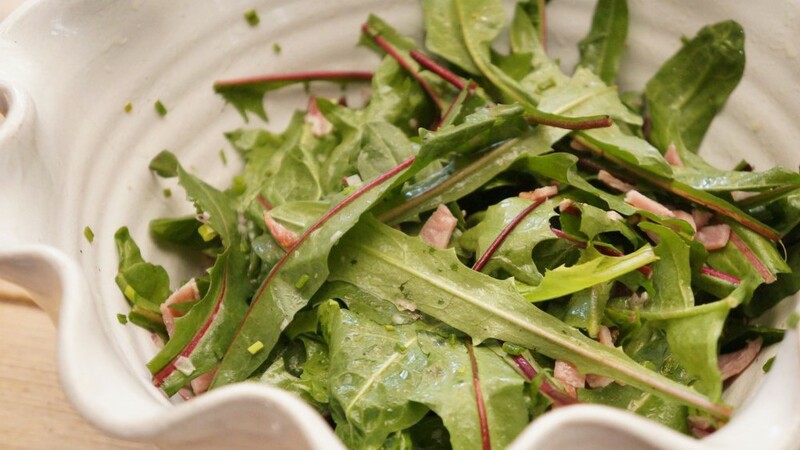 Put the shallot, chives, vinegar, oil and a pinch each of salt and pepper in a large salad bowl and mix together with a fork. Add the dandelion leaves and bacon and toss until the leaves are evenly coated. Taste and adjust the seasoning with salt and pepper and serve. Oven preheated to 350F. Stir all of the ingredients together in a large baking dish and bake for about 30 minutes. The rhubarb should be tender and should release some of its juices. Remove from the oven and take out the vanilla bean. Scrape the seeds into the rhubarb mixture with the tip of a knife. You can serve it warm or cold, over yogurt or whipped cream. What do you look forward to eat most in the spring?